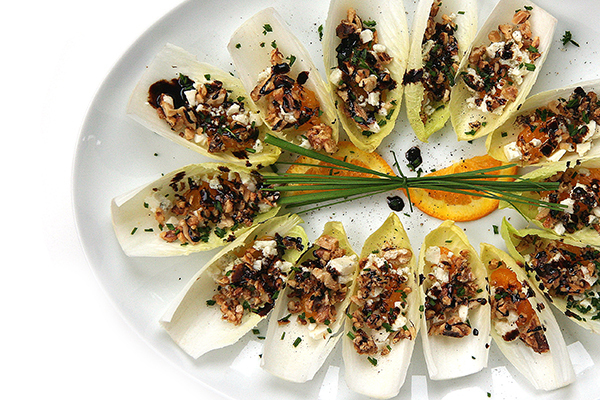 Fresh orange, honey-toasted walnuts and blue cheese sit on a Belgian endive leaf, drizzled with a balsamic-orange reduction and sprinkled with fresh chives and salt and pepper. Preheat oven to 350¡. Combine walnuts and 1 tablespoon honey; spread on a baking sheet coated with cooking spray. Bake at 350¡ for 10 minutes, stirring after 5 minutes. Combine 1 tablespoon honey, vinegar, and orange juice in a small saucepan. Bring mixture to a boil over high heat, and cook until reduced to 3 tablespoons (about 5 minutes). Fill each endive leaf with 1 orange section. Top each section with 1 teaspoon cheese and 1 teaspoon walnuts; arrange on a plate. Drizzle the vinegar mixture evenly over leaves, and sprinkle evenly with chives and pepper. Variation Make a BLT-version! Mix sliced grape tomatoes with some chopped fresh thyme and chives, a little champagne vinegar, a splash of olive oil and salt and pepper. 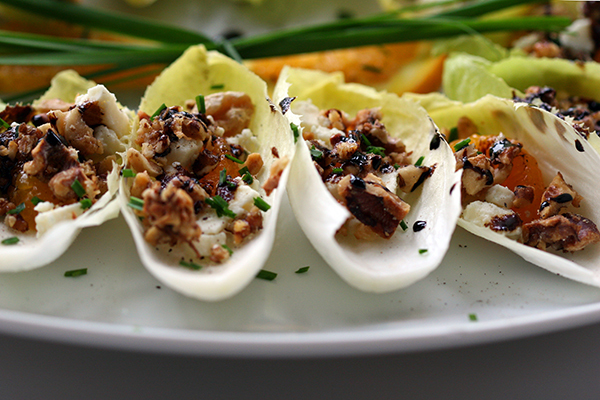 Fill endive leaves. Sprinkle with bacon crumbles. Serving these at a cocktail party? 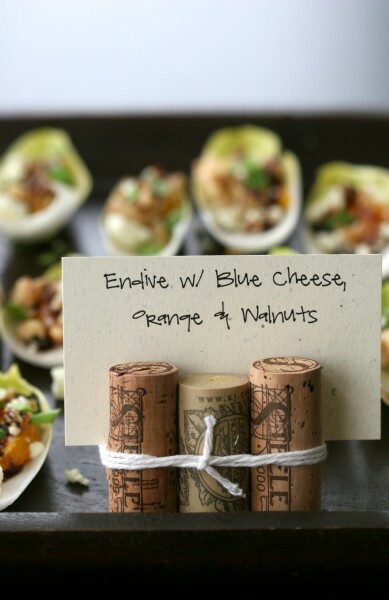 Let your guests know what they’re eating with these apped’oeuvre place cards. Absolutely wonderful! I served these at a dinner party and they were a big hit! It’s difficult to find elegant and delicious appetizers that are quick and easy to prepare. This fit the bill perfectly! Oh Mary, I’m so glad you liked them! I love playing around with the endive “base” and making other combos – like adding bacon, tomato and a little spicy mayo… or fig & prosciutto. I’m going to do a similar appetizer. Gorgonzola, craisins, walnuts and balsamic vinegarette. If you whip the balsamic vinegarette with a hand blender, it becomes thick and emulsified. Oh Melissa, that sounds yummy!